A few flashlights offer flood and spotlight options, but they accomplish the two light options by using a zoom lens, making the user pick between flood or spot. The B.A.M.F.F. series offers the user the option to flood the immediate area and cast a blinding spotlight into the distance, at the same time. This dual LED combination illuminates the users' peripheral vision as well as their focal point. Users can now see far down the hiking trail, while also lighting up the area around their feet and both sides of the path. The BAMFF 8.0 comes well-equipped with an 18650 rechargeable Lithium Ion battery and USB charging kit. Also, as a unique emergency feature, the 8.0 also comes with a "AAA" battery cartridge for those times when you can't charge your rechargeable 18650 battery, thus ensuring you are never left in the dark. The B.A.M.F.F. will open your eyes to a whole new way of seeing at night. The B.A.M.F.F. eliminates the tunnel vision you get with a traditional flashlight and allows you to utilize your peripheral vision. The broader range of light greatly increases your field of view by illuminating objects, or even dangerous situations, that otherwise would have been left in the shadows. Tbook.com crawls the web to find the best prices and availability on Flashlights and related Tools and Hardware products like BAMFF 8.0 - 800 Lumen Dual LED Tactical Flashlight. For this page, related items include products we find that match the following keywords: "Flashlight" at our vendor partner Home Depot. 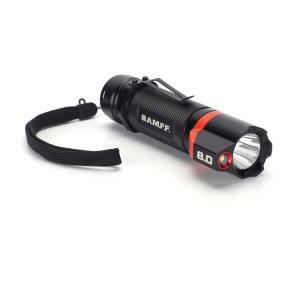 BAMFF 8.0 - 800 Lumen Dual LED Tactical Flashlight is one of 152 Flashlights and related products listed in the Tools and Hardware section of Tbook.com If you have any questions on this product, please give us a call at 734-971-1210 during the hours of 9am - 5pm EST for assistance. Thank you for shopping at Tbook.com, the Internet Department Store!